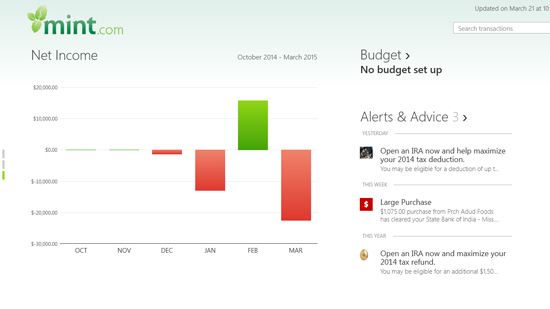 Mint.com Personal Finance is a very powerful app for Windows 8 to manage your personal finance. It enables you to have access to all your bank account under one roof. It helps in accessing your accounts quickly and manage them well without making it difficult for you to sign in and browse them separately somewhere else. Mint was popular as a web application earlier but with years it has emerged as a great personal finance app for managing not only your financial expenses but also how your account is working. It helps in making finance and expenditure management easy for the customers and users, and is currently owned by Intuit inc.
With Mint, you have access to your money and bank accounts from everywhere. The app for Windows 8 is highly interactive and impressive. On the startup, Mint asks you to login to your user account. If you do not have one, then you will have to sign up for it. 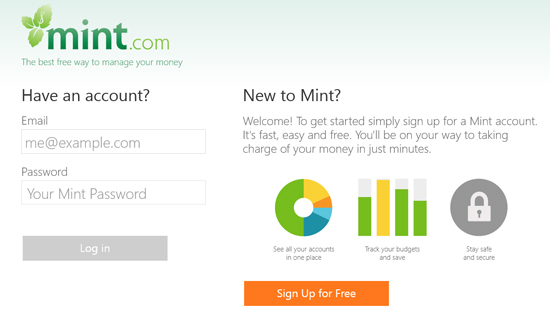 After signing up, you can start adding your bank accounts, credit cards and investment accounts in Mint. Mint covers all the popular banks from different countries. It lets you search for your bank in the search tab and it will show you the bank login page if supported. You can now sign in after choosing your bank.The sign in is done with your online banking username and password. It will take you to another page where you can see the details regarding your account. When you login to your Mint account, it asks you to input passcode for security reasons. The dashboard of your account shows you the spending you did by categorizing it in a pie-chart, it shows the budget you have set. The third tab shows you the accounts you have added to your Mint account. After Accounts, Mint shows the recent transactions done by you from your selected account. The fourth tab shows the expenses done in terms of how much spend under which category. If any transaction is not mentioned in the app, then you can manually add it to your account by right clicking anywhere and clicking on Add a transaction from the bottom right button. You can receive bill alerts in your email or on your phone for all upcoming bills and payments. Not only this, Mint also helps you keep a track of any kind of unusual activity on your account. In addition to all the above features, Mint can be synced across all the platforms where you have installed the Mint app. 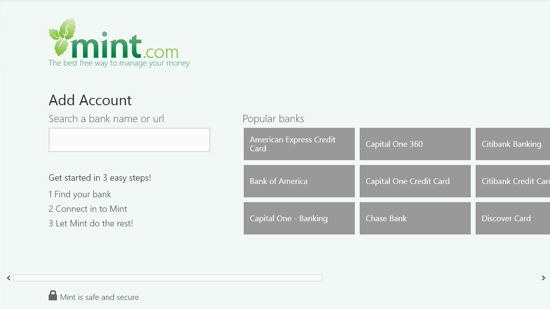 Get Mint.com Personal Finance for Windows 8.